Three Rivers Press, 9780307408532, 192pp. Julia Wertz has gathered the stars and soon-to-be-stars of the graphic art world, including Peter Bagge, Jesse Reklaw, Tom Hart, Sam Henderson, Laura Park, Emily Flake, Keith Knight, Janelle Hessig, Gabrielle Bell, Aaron Renier, Austin English, Corinne Mucha, Jeffrey Brown, Alec Longstreth, Minty Lewis, Joey Sayers, David Malki, Kazimir Strzepek, Ken Dahl, Shannon Wheeler, Shaenon Garrity, Rodd Perry, Abby Denson, Damien Jay, Sarah Glidden, and dozens more, to interpret these plaintive, hopeful postings in drawings that range from laugh-out-loud funny to disarmingly strange. 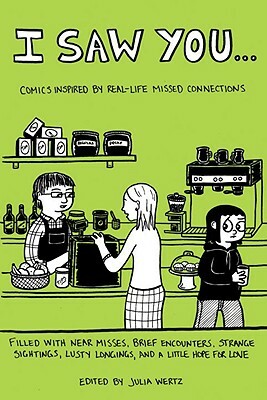 JULIA WERTZ is a cartoonist and writer and the creator of the autobiographical comic "The Fart Party." She lives in Brooklyn.